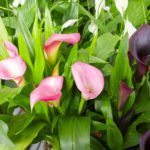 Which is the correct way up for a calla lily rhizome when planting? Mine seems to be sprouting from underneath rather than the top. The Calla Lily bulb or rhizome should be planted horizontally with the growing side up-about 4 inches in the soil or ground. Generally place the rhizomes 12 inches apart.